We're in Ecuador and it's awesome! Today is our 3rd day here. The first day was essentially a travel day. We learned a couple of important lessons: (1) Quito is huge and surrounded by gorgeous mountains, (2) traffic is crazy here, and (3) the altitude messes with your head. Seriously, I keep getting low grade headaches, and I find that I'm catching my breath after activity which shouldn't wear me out (like walking up steps). I guess that's life in the highest official capital city in the world. On day two we headed out of town with our first stop being at Mitad del Mundo (aka, the Middle of the World) monument. Along with snapping many photos of us straddling the Equator, we also got to see some terrific views of Quito from the top of the monument. From there, we continued on our way to the town of Mindo and access to a Cloud Forest. The ride to Mindo was a harrowing one. Ecuadorian drivers are known for being a little, shall we say, creative. And on the one lane twisty mountain roads, they pass with fairly reckless abandon. For sure they treat solid yellow lines approaching blind curves as merely a suggestion that you shouldn't pass, and not a requirement. Shira, for her credit, more than kept up and by the end of the trip had the hang of it. I just held on for dear life. Once we got to Mindo, but before we hit the trail, we decided to have lunch. The menu was in Spanish, but not to fear, we have Google Translate and T-mobile Free Data (seriously, we get better data access here then we do in Rochester, NY). I explain to the waitress: we'd like one Tilapia in Mushroom sauce (grilled), and one order of scrambled eggs. So naturally, what comes out is: one Tilapia in mushroom sauce, one Tilapia that's been grilled and two orders of scrambled eggs. Apparently my Google Translate skills need work, but lunch was excellent. Hiking through the Cloud Forest was awesome. I chickened-out and wouldn't take the sketchy looking cable car across the ravine, so rather than see 4 waterfalls we took a trail to see one of them. Still, the hike was top notch. We saw plants that belonged in a Dr. Seuss book, a number of interesting birds. And when we finally reached the waterfall, I was able to put my feet in the chilly water to relax. Today we did more hiking, but much closer to home. Specifically, we traipsed around Parque Metropolitano, a massive park with plenty of unmarked trails. We caught a glimpse of hummingbirds and found more interesting plants to gape at. There's also a number of large sculptures throughout the park, so I'm going to count the hike as a visit to an art museum. Another highlight of today: we celebrated Thanksgiving with our friends, Matt and Abbie, and their two adorable children, who we came here to visit. They live in Quito and were generous enough to open their home to us this trip. So not only am I thankful for all the usual stuff (an amazing wife, wonderful family, terrific job, heat, air conditioning, shoes, etc.) I'm also thankful to have such awesome friends. 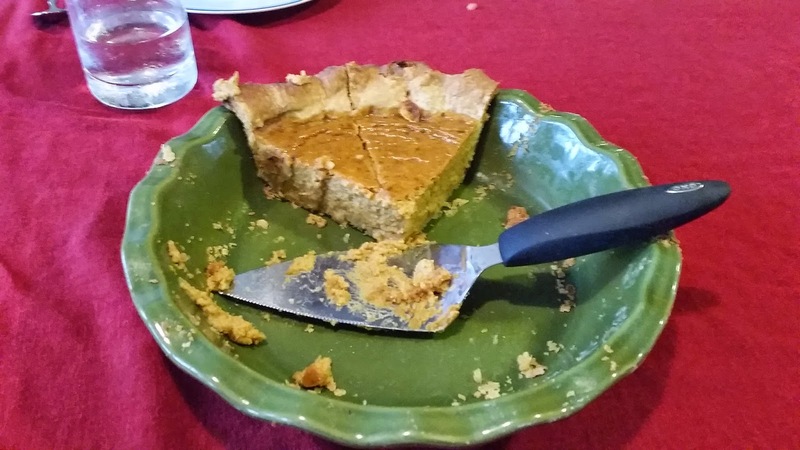 To their credit, they created the perfect thanksgiving feast, including homemade cranberries and pumpkin pie. This is no easy feat considering Ecuadorians don't eat cranberries or pumpkin. Along with their culinary skills, Matt and Abbie have also been invaluable in giving us the lay of the land. Like, say, this tip that our guide book failed to mention: public bathrooms (including restaurants) often have the toilet paper available *outside* the stall, and you should grab some before you enter. That was super good to know and came in handy almost immediately. Another approach, which we saw at Mitad del Mundo, is to make entrance to the bathrooms free, but charge for the TP. Very clever. As you can see, we're having a blast. Enjoy some pictures of the trip below.